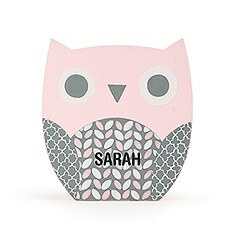 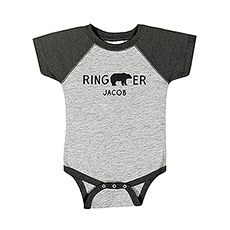 At Weddingstar, we make it easy to find personalized baby gifts that pop with style and personality. 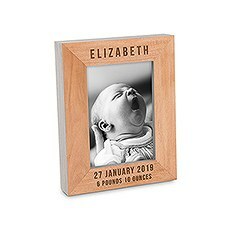 So, if you’ve been scratching your head trying to think of cool baby gift ideas, browse this collection for inspiration. 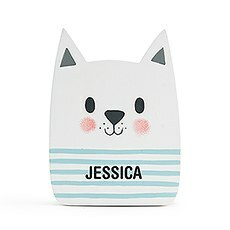 Baby gift ideas range from the purely decorative to practical, and your gift can make mom, dad and a growing child smile each time they gaze upon your chosen item. Babies require comfortable bedding to sleep soundly like babies should, and that’s why our collection includes baby blankets. 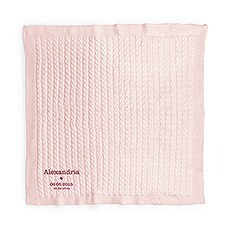 Our knit baby blankets are crafted of cotton and they’re soft to the touch, giving baby snuggly comfort and lightweight warmth while slumbering. 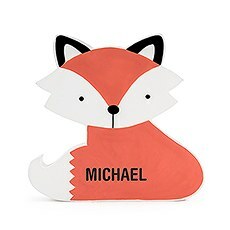 Choose your desired colour and then add custom text, which might be a baby’s name or a sweet sentiment. 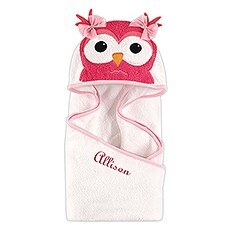 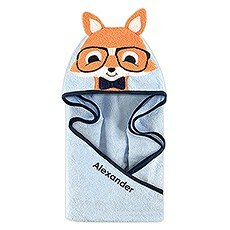 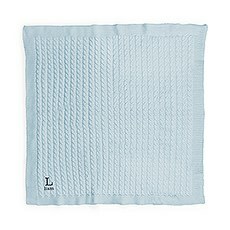 Babies and toddlers can also remain nice and cozy when wrapped in our adorable hooded towels. 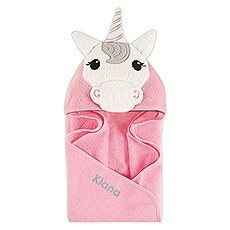 These cotton terry towels include a hood that helps keep the towel in place as the child is dried off after a bath or a dip in the pool. 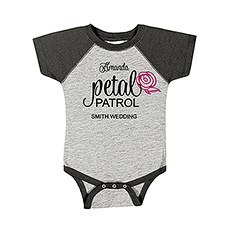 These days it’s not unusual for babies to make an appearance in the bridal party at a wedding. 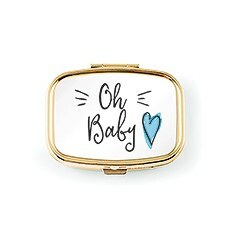 And, because everyone else is dressed for the occasion, we figured we’d help you find something appropriate for the baby to wear too. Thus, we offer a selection of adorable onesies for the littlest members of the wedding celebration. Find onesies for infant flower girls and ring bearers in sizes that range up to 24 months. 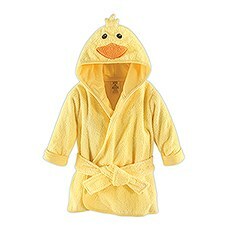 Children’s robes make thoughtful “thinking ahead” baby shower gifts that can be useful as a child reaches the toddler stage. 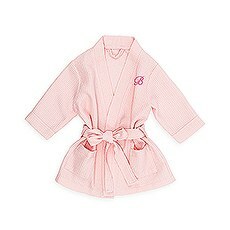 Crafted of cozy cotton terry or polyester, our luxurious robes include belts and pockets for storage. 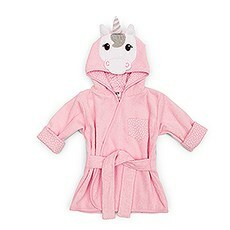 Choose standard robe styles or any of our fun animal character styles with hoods. 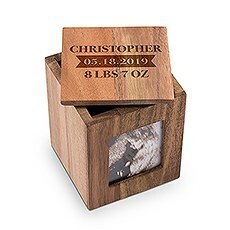 Keepsake gifts are quality items that are treasured by families throughout the years, evoking fond memories long into the future. 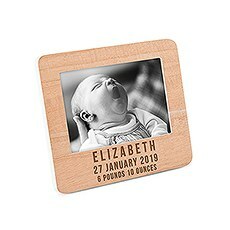 We offer numerous keepsake gifts that commemorate the birth of a baby. 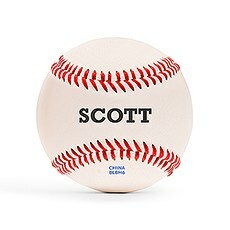 Ideas include engraved photo frames, gift boxes, commemorative baseballs and decorative tooth storage boxes.